On February 27, 1929, the Orlando Evening Star announced that Miss Mary Morse and Miss Margaret Collard, recently of Argentina, had purchased property in Loch Haven, where they planned to build a Spanish home. They paid cash for two lots to the west of the “super artistic typically Mediterranean home now in the course of construction by Miss Matilda A. Fraser.” It is not certain that their house ever materialized, but Miss Fraser’s elegant mansion, designed by the Orlando architectural firm, Ryan and Roberts, remains one of the city’s finer examples of the Mediterranean Revival style of architecture popular during the 1920s Florida Land Boom. Matilda Alexandra Fraser, born in Canada in 1865, immigrated to the United States with her family in 1866, and grew up in Cleveland, Ohio. She studied at Oberlin College in Oberlin, Ohio, in 1894-1895, and graduated from the Massachusetts Institute of Technology about 1896. She taught in the mathematics department at the Girls Latin School in Boston, Massachusetts, for thirty years, retiring in 1927. From the beginning of her teaching career Fraser took an active role in educational organizations, publishing studies and serving on committees. In 1917 she argued for pay equity for women. She served as an officer in the Women’s School Voter’s League in 1911, and in 1913 she joined a party of Boston suffragists on an automobile trip to Washington, D.C., to take part in a constitutional amendment demonstration on July 31. Traveling in a car decorated with pennants and banners promoting votes for women, the group stopped for suffrage meetings along the way. Matilda Fraser, whose father was an architect in Cleveland, Ohio, could well have been acquainted with architect Ida Annah Ryan in Boston. Fraser was eight years older and graduated from the Massachusetts Institute of Technology several years before Ida Annah Ryan, who graduated in 1907, but both were members of the Cleophan social club at MIT, and, as single, professional women, both supported feminist causes. Ryan already worked in Orlando when Fraser retired in Boston and bought her building site on Orlando’s Lake Formosa. Architect Ida Annah Ryan, the first woman to graduate with a Master of Science from the Massachusetts Institute of Technology, won a scholarship in 1907 that enabled her to study architecture in Europe. She spent most of her time in Spain and Italy. Ryan established the first women’s architectural practice in Waltham, Massachusetts, designing structures in New England and in Central Florida, but the Massachusetts chapter of the American Institute of Architects refused to accept her because she was a woman. They joined a group of architects in Orlando who sought to create a distinctive Florida architectural style, one especially suited to the Central Florida climate. The Mediterranean Revival style, with its low pitched roofs and wide eaves, built of more durable stone and clay tile, met the need and became popular in 1920s Orlando. Matilda Fraser bought three lots in the new Loch Haven Subdivision on Orlando’s Lake Formosa. In 1928, she took out a building permit for a residence to cost $21,700. She hired the architectural firm of Ryan and Roberts to design the house, and C & O Construction to build it. When the 1926 subdivision was replatted in 1930, her property became lot 3 of block 9. Fraser chose an elegant setting for her home. Developers of the Loch Haven Subdivision advertised a “secluded retreat” and a “vista of green, wooded slopes” set among three lakes. They promised paving, sidewalks, sewers, water and gas mains, and underground lighting and telephone systems. The home sites featured orange trees remaining from the Charles Jacocks grove, famous for its pecans and oranges from 1879 until 1915, when Jacocks’s widow sold the forty-four acre property, for $50,000. The grove continued as a mail-order business until 1923. The Loch Haven Company bought it in 1926 for a residential development. Ryan and Roberts designed a Mediterranean Revival masterpiece for Matilda Fraser, adding their own trademark embellishments. Built of concrete block and stucco, with a traditional red barrel tile roof, the 15-room mansion features the architects’ signature shapes and asymmetrical arrangements of the windows for the most pleasing play of light. Varied ceiling heights and step- downs add flavor, while Spanish tile floors, accented with art deco Rookwood tiles, and two sets of French doors opening to a large open porch in the back make it a charming residence. Matilda Fraser lived for a decade in the house she called “Villa Formosa.” The federal census found her there in 1930, but the city directory shows nothing on the site until 1931. In fact, for several years hers was the only house on North Lake Fprmosa Drive. She reportedly lived alone, though she employed a cook who shared the house. The 1940 census report has her widowed sister, Belle Smith, living in the house with her, along with two other women. Fraser entertained frequently, giving teas and luncheons for friends, and regularly hosting meetings of the American Association of University Women, beginning with an elegant Christmas tea in December 1930, followed by a large reception for Boston friends on New Year’s Day 1931. Houseguests from Boston and family from Cleveland visited each winter. Margaret Collard and Mary Morse, who had hoped to become her neighbors, came to Villa Formosa from Orange City, where they settled instead. They later returned to Argentina, where they both died in 1945. Matilda Alexandra Fraser died on April 30, 1940. She valued her home enough to make special provisions for it in her will, requesting that the house be offered for sale for two-thirds of its appraised value to three people, in the sequence that she named them. The first person, a relative, declined the offer, but the second, Raymond D. Robinson, bought the house for $9,310.70. He lived at Villa Formosa for six years, before selling it in 1946. Like so many ambitious developments in the 1920s, the Loch Haven Subdivision fell victim to the Great Depression of the 1930s. The city foreclosed in 1931, taking possession of the failed development, by then with liens of nearly $100,000 for paving and sewer assessments. Plans called for a world’s fair, called “Florida on Parade,” to be built on the site of the Loch Haven Subdivision, but that, too, failed in 1936. The city eventually offered some of the properties for sale and created a city park on others. Villa Formosa now faces Loch Haven Park and the Mennello Museum of American Art, with Lake Formosa at its backyard. When the City of Orlando foreclosed in 1931, it took possession of all of the Loch Haven development except Matilda Fraser’s property, which she had occupied for at least a year. The Florida on Parade failure possibly spared her a fight to keep her beloved mansion. In 2008-2009, the city again attempted to acquire the house, this time to be demolished to create green space around Florida Hospital. Four houses were bought and destroyed, but with a recession coming, the Villa Formosa offer was withdrawn. It would appear that economic downturns have twice saved the irreplaceable mansion, an outstanding example of Mediterranean Revival architecture and one of only two remaining Ryan and Roberts-designed houses in Orlando. March is Women's History month. We are remembering women who have made history in the past and those that are still making history today. Women Making History in Central Florida will showcase four women who have and will continue making history. We hope that their stories will inspire you to impact central Florida in your own way. The Great Florida Land Boom of the 1920s brought thousands of new residents to Orlando, increasing the city’s population three-fold between 1920 and 1930. By 1921, the effect on the city schools was already evident, with a 40 percent increase in school enrollment in just one year. The Orlando Sentinel announced in a headline on October 7, 1921, that the city “Outgrows School Buildings Fast As Completed.” By the decade’s end, the school board had built eight new schools, among them the Cherokee Junior High School, which opened in 1927. The school board specifically wanted to locate a school in the southern residential district around Lake Cherokee, first considering property owned by Harold Bourne, before settling on two lots in Block 6 of the F. T. Poynter Addition to Orlando, for which they paid $120,000. With only three residences and two owners for 3.27 acres of land in a choice residential area, the property suited the requirements for the new junior high school. The board planned to move the three residences on the site to nearby lots for eventual rental to school teachers. Bruce and Elizabeth Compton, who lived in Philadelphia, Pennsylvania, owned Lot B and one of the houses, while Mrs. Mattie L. Smith owned most of the larger Lot C and two houses located there, including her family home at 529 South Eola Drive. Mrs. Smith reserved her right to remove landscaping and citrus fruit from her premises within six months of the date of the sale. Her houses were moved to become 621 and 623 Palmer Avenue and remodeled into apartments, known for several years as “the Teacherage”. Compton’s large house on Lot B was moved a few feet east and turned to face Summerlin Avenue, where it became the Manual Training Center for the new junior high school. Architect Howard M. Reynolds drew the plans for the school building and the Peterson Construction Company won the contract to build it with a low bid of $304,500. Construction began in August 1926, at South Eola Drive and Palmer Avenue. Reynolds designed the two-story building around an open court, where he put its steam heating system. Intended to accommodate one thousand students, the school included an auditorium to seat the same number of people. The auditorium occupied a major part of the first floor, along with a cafeteria, and offices. In a separate structure, between the main building and Summerlin Avenue, a gymnasium featured locker rooms for both sexes. The following year, the Orlando Sentinel pronounced the nearly-completed Cherokee Junior High one of the “finest and most magnificent” schools in the South. The paper characterized the Mediterranean Revival construction as a blend of Moorish and Spanish architecture, with colorful, decorative terracotta features. Eighty-five years later, in his blog, Transformations and Whispers, John A. Dalles found the Cherokee School “wonderfully whimsical,” and an “architectural treasure” incorporating Art Deco and Prairie Style influences, as well as Classical. Most notably, he saw the work of the Renaissance sculptor, della Robia reflected in the colorful terracotta “festoons, keystones, and swags.” He pointed to the “stylized owls” topping the columns, “symbolic of wisdom” as appropriate for a school. Dalles praised Howard M. Reynolds, one of several architects working to create a distinctive Florida architectural style, for his success with the Cherokee School. Reynolds became the County School Board’s choice for school construction after a 1922 conflict between the Local Trustees for Orlando’s School Taxing District Number 1, which had little if any authority, and architect F. H. Trimble, the designated architect for the Orange County School Board, who designed and built Delaney Elementary school in 1921 and a new high school on Magnolia Street in 1922. The controversy, ostensibly over safety issues, dragged on into 1923. Meanwhile, Howard Reynolds designed and built the new Jones High School in 1922. Trimble began accepting design work out of the area and Howard Reynolds, evidently on the strength of his Jones High School work, designed the Marks Street School in 1925, as well as six other 1920s-era school buildings, including the Cherokee Junior High. Six years after the Cherokee School opened to junior high students living south of Central Avenue, controversy developed again. In their efforts to renegotiate bonds to shift money from paying for real estate to paying teachers during the Great Depression, school attorneys determined that the purchases of property for the Cherokee School were illegal and that no more payments should be made on those properties. In the frenzy of the Land Boom, the urgent need for land for school construction resulted in the Local Trustees overlooking the legal process for acquiring property. Once the trustees made their choice of land, they should have informed the county board, who would turn the matter over to the county commissioners, who would call a special election of freeholders. The process had not been followed, and the board argued that the money used for interest and note payments on the properties for the Cherokee School could legally be used to pay teachers’ salaries. Seven people held notes on school property purchases in Orlando, for a total of $226,250. In the case of the Cherokee Junior High property, Mrs. Mattie Smith held the largest note, for $50,000. Mrs. Smith agreed to take negotiable paper of $42,000 value in return for the notes on the property. She also agreed to reduce the interest rate to the school board from eight to six percent. The other major note holder, Bruce L. Compton, sued to recover $15,000 principal and interest yet due on the site of Cherokee School. Compton admitted that he had little chance of getting any more money and requested the return of his land. The school board asked to have the suit dismissed, arguing that Compton, who had received $15,000 at purchase, plus interest on the additional $15,000, should return the money before he asked for his property back. The Cherokee School, no longer a junior high school, remains a part of the Orange County Public School system. Students and teachers come and go, passing the owls Howard Reynolds designed nearly a century ago to symbolize learning and wisdom. The Compton and Smith houses are no longer on the school property, and cars park on the large open space at the corner of South Eola Drive and Palmer Street that probably started as a playground or sports playing field. The structure itself, though, appears as beautiful as ever, and in 1981, the Lake Cherokee Historic District became Orlando’s second locally designated historic district, with the Cherokee School its most architecturally significant institution. The school’s future may be uncertain, however. In 2016 the school board announced coming changes in the program housed at the Cherokee School, but provided no definite decision about the school or any timeline for making such a decision. Two recent high profile events celebrated the importance of historic preservation in our community. The first celebrated the architectural design detail of mid-century and the other the preservation and rehabilitation of a residential structure in a moving way. The first event was on Saturday December 1st out front of the Orange County History Center with the unveiling of a portion of the brise soleil that adorned the round building that was once where the new Dr. Phillips performing Arts center now stands. The ceremony was presided by John Kaiser of Designage. In attendance were civic officials and leaders, members from Nils Schweitzer Modern Group, and the many partners who donated services and materials. 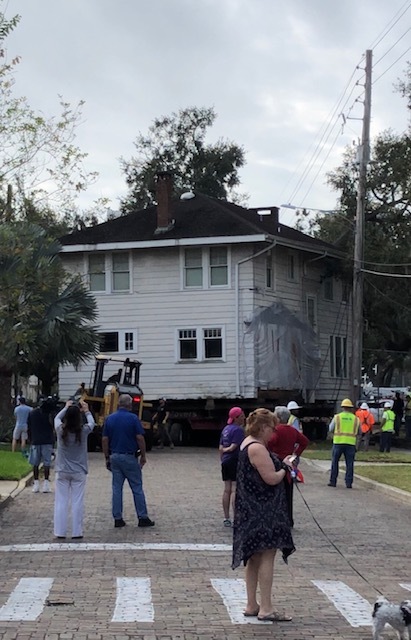 The second event was the relocation of the 1921 structure that once stood on the corner of Broadway Ave and Ridgewood Street in the Lake Eola Heights neighborhood. It was moved two blocks north and east to the corner of E. Livingston St and Cathcart Ave. While there had been some controversy of its inclusion as a contributing structure in the local Lake Eola Heights Historic District it is a contributing structure in the Lake Eola Heights National Register District. Many residents, who patiently endured the utility outages and traffic disruption, as well as media watched as the large structure made its way through the neighborhood to its new home. The new site which had a rear structure was able to accommodate the home as it had never been fully developed. The vacated site is planned for a 5-unit condominium development. Samuel Austin Robinson came to Orlando from Michigan in 1876 to help his older brother, Norman, set out a citrus grove in what is now Lake Eola Heights. A civil engineer, Sam Robinson soon established a surveying practice in Central Florida and worked for seventeen years as Orange County’s Surveyor. He also served as tax assessor and tax collector, alderman, school trustee, and city surveyor, in addition to two terms in the State Legislature. Robinson laid out the downtown streets, and with Otto Fries, he surveyed the new Greenwood Cemetery. Sam first built a log house on Norman Robinson’s grove land at the northeast corner of Hillcrest Street and Cathcart Avenue, followed in 1884 by one of the first houses in the Lake Eola Heights area. Robinson built on land deeded to him in 1878 by his brother before the area was platted, resulting in difficult property descriptions. His acreage eventually became part of the Speirs and Lockharts Subdivisions, but efforts to trace property ownership remain complicated. Robinson lived in the house until 1900, when he sold it to Levi Dodge, for $2000 and release from the mortgage Dodge held on the property. Sam Robinson relocated at that time to the North Main and Washington Streets area, where he occupied several different houses over the years and died in 1926. At some time, probably before 1913, renovations to the front façade of the Magnolia Avenue house, including the addition of the four two-story columns, changed the Colonial Revival house to an imposing Classical Revival mansion. In 1902, Dodge sold the same property to Isaac C. Mann, who lived there until his death in 1917. His widow, Lizzie Mann, sold it to Alice H. Baker for $5000 in 1919. John and Alice Baker sold the house in 1920 to T. C. Brannon. Brannon, a citrus inspector, conductor on the Seaboard Air Line Railroad, realtor, and prominent Orlando citizen, occupied the residence, advertised as “The Magnolia,” for fifteen years. The very social Brannon family gave numerous parties and gatherings, and they operated a boarding house, renting out rooms in the former Robinson house. The Broadway Methodist Church was organized at a meeting in the house in 1922. In 1934, the Majefee Corporation, a housing construction firm which held a mortgage encumbering the property on Magnolia Avenue, foreclosed on T. C. Brannon. The judgement required that the property be sold at auction for no less than $9,000 and Majefee was the highest bidder. The house, called “The Colonial,” operated as a boarding house for the next ten years. In 1936, the Colonial Tea Room advertised in the Winter Park Topics: lunches, dinners, special parties, and rooms by the day or the week. The Orlando Sentinel society column praised the colonial atmosphere, furnishings and architecture, and noted “the particular charm” of the house. By 1946, when the Majefee Corporation sold the property to William C. Haynie, commerce had begun to move out from the city along Magnolia Avenue. Luther and Virginia Damron bought the house in 1948, with plans to open a twelve-room tourist hotel to be called “Magnolia Manor.” The Damrons paid $32,500, with $13,000 remaining to be paid on $15,000 mortgage granted to the Majefee Corporation. The Damrons sold the property to W. O. Daley, a certified public accountant, in 1954, and Daley’s newly organized firm, Four Nineteen, Inc., occupied the structure until 1986. The Daley family sold in 2015 to Thorne Properties. Today, Sam Robinson’s Colonial Revival residence that fronted a vast orange grove in 1884, has become a Classical Revival mansion on a heavily-traveled street in the heart of Orlando’s downtown. Parts of the residential neighborhood that replaced the orange groves has itself given way to commercial concerns, and 419 Magnolia Avenue, a business for more than a half-century, led the way. The imposing four-columned mansion appears wedged between two unfortunate additions of its own with businesses flanking those. The oak trees that Sam Robinson planted are all gone in this section of Magnolia Avenue, which has been realigned so that the house is set back from the one-way street on a curve, obscuring it from the fast-moving traffic. Many Orlandoans who pass every day have probably never noticed the beautiful and historically important house at 419 North Magnolia Avenue.